Stick around for the parade, food vendors, street vendors and all day fun at Western Heritage Days, Downtown Dewey, and at Prairie Song, Dewey on Sunday. Adult & Youth T-Shirt sizes available. Those who register before September 1st are guaranteed a t-shirt in the size indicated. After September 1st, sizes are not guaranteed. Those who register by September 1st are guaranteed a t-shirt in the size indicated. Awards to runners will be presented by gender and age group, including youth, and overall male and female. Participatory awards will be given the first 300 registrants, aka, awesome runner bags! 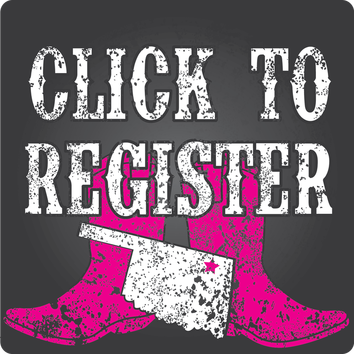 We will also award the Most "Pinked Out" Participant, Most "Pinked Out" Team and/or the largest team. Don't miss the Pre-Party! 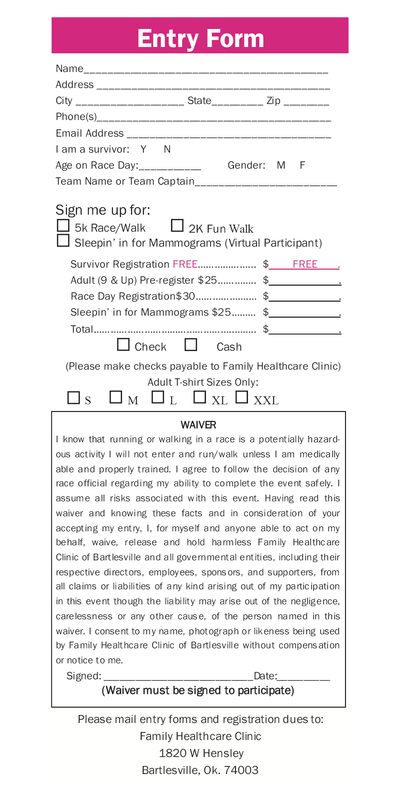 Thursday, September 20th at Family Healthcare Clinic from 5:00 to 7:00 p.m. You can pre-register NOW and we will have your t-shirt and race packet ready for you to pick up at the Pre-Party. You can also register at the pre-party and get your race packets early. We will have popcorn and refreshments for you too! Pre-registration ($5 off) is open at the party! You can register Saturday morning for $35-Adults & $25-Youth. T-shirts may not be available for long on Saturday. Online registrants will have a box to enter their team name. Make checks payable to Miles for Mammograms. Please keep donations separate from entry fees. Teams can also register online by entering team information in appropriate box. This event will occur during rain or shine. We reserve the right to cancel in extreme circumstances. The safety of our volunteers, participants and staff are at the heart of any decision made to cancel. In the 19 years this event has taken place, we have only canceled once due to the threat of high winds and lightening. In that event we do cancel, there will be no refunds, rather, your entry fee will be used as a donation. In case of cancellation, if you are in the first 300 to register, you may pick up your t-shirt at Family Healthcare Clinic after September 24 and during clinic hours.